Discussion in 'The Lounge' started by philip wood, Dec 16, 2017. Is anybody willing to put some of there photo's of there fish room's on here ? The reason I ask is I need to be inspired for the new build I am planning to do in the spring. Or even does anybody know any youtube footage I can take a look at ? maybe something that I have never seen before. I usualy just type in fishroom build or dwarf cichlid fish room so does anyone know of any other. I checked out several of my saved links and it looks like none of the pictures work since photobucket did their change up. What a waste!! I'm really bummed about that. 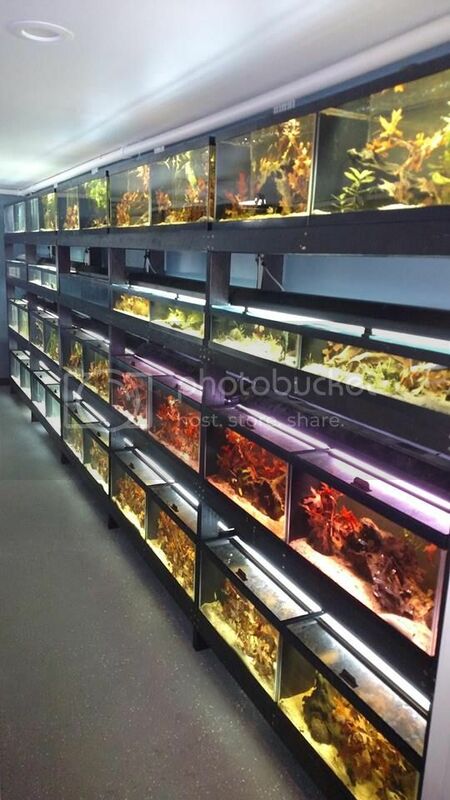 SwissTropicals had a nice webpage about his fishroom,but I can't find that anymore. Yeah I have been following Teds Site for a few years now. But was not aware that Swiss Tropicals even had a video of there fish room I thought he was concentrating more on his filter design than breeding fish, So maybe that's why he has taken it off the web. But thanks for the link to Teds fish room it still has a few interesting vids I want to see. dw1305 and Mbkemp like this. Mbkemp and Viridis like this. No worries. I was looking for it not too long ago as well. I ended up saving all the pictures incase it gets taken off of web archive for some reason. Oooooooh!!! What are the dimensions of the short tanks? I really like those. Do you like the shorter height verses, say a 15 gallon (twice the height)? Any reason for going shorter? Or is it just to fit more on the rack? Apistos rarely rise more than 8"/20 cm above the substrate. The extra height is unused. Maybe this depends on how secure they feel. My main tank is almost full of Pistia and my Apistos spend their time in every level. That is true. If there aren't enough hiding places on the bottom, they will live among dense roots of floating plants like you have. Even in the wild, apistos have been found among the roots of floating meadows. Still, being a geophagine, their preference is to be a bottom dweller. In the wild, I rarely saw an apisto more than a few centimeters above the leaf litter, where they could quickly hide from danger. My latest tanks have been long (up to 6 foot) and deep (up to 2 foot) but 10" or 12" inch tall. However, if you keep a group of apistos and subordinate individuals need a place to hide then in tall tanks they can go up and hide in the floater roots where the dominant fish doesn't seem to look as much or perhaps it doesn't care about fish not competing for substrate territory. Someone told me they floated black PVC pipes at the surface for fish to hide in, something I intend on trying. 2) cuts down on aggression by limiting the line of sight-the aggressive fish, often the dominant male, can't gain a longer line of sight by moving up in the water column. These means that leaf litter in the tank provides plenty of safe hiding spots and I don't need to worry about providing as many vertical plants or other structure. dw1305, aarhud and Mbkemp like this.